Portland Trail Blazers forward Jake Layman (10) dunks past Philadelphia 76ers guard Jimmy Butler (23) and center Boban Marjanovic (51) during the second quarter at Wells Fargo Center. 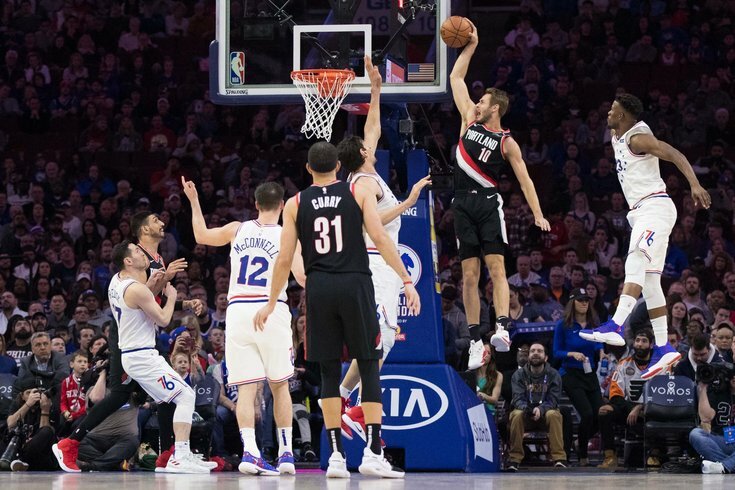 Let's not put lipstick on a pig — the Portland Trailblazers came out and flat-out cared more than the Sixers did on Saturday, and it showed in the result. With Philadelphia playing lackadaisical defense and showing no interest in going hard on the glass, Portland disposed of them rather easily in a 130-115 loss for the home team. There are not many times I can recall the Sixers just failing to show up for a game, but this was one of them. They got the exact result their performance deserved. Here's what I saw in Saturday's game. • After struggling in his first game back Thursday night, you weren't really sure what to expect from Jonah Bolden against Portland. They're a particularly tough team for a guy with his body type, with Jusuf Nurkic and Enes Kanter both presenting problems in the post. But Bolden took on the defensive challenge admirably, battling with Portland's bigs well in the post and forcing turnovers or tough shots, both of which are wins for the Sixers. Being able to hold up there would be big for the Sixers in the postseason because if they can count on him to use his foot speed and be physically tough enough to battle down low, it makes him useful in different sorts of matchups. The usual activity and athleticism was still evident as well. Much better showing from him today — perhaps that just shows he needs regular minutes to get in a groove, like plenty of other guys around the league. Unfortunately, Brett Brown abandoned him in the second half, and I can't really figure out why. He continued playing hard in garbage time, and deserved better than he got. • When Ben Simmons gets a matchup against a small-ish backcourt, which frankly at his size is nearly every night, he needs to approach the game like he did in the first half against Portland. Simmons made it a point to back down the likes of CJ McCollum and Damian Lillard, who have very little chance to hold up against him when he's backing them down. His free-throw shooting was just as encouraging. There's often a symbiotic relationship between how well Simmons is shooting at the line and how willing he is to attack, so regardless of the impact the points have on the game, it's always good to see him knocking down free throws, because it's usually a sign of good things to come. • The Sixers absolutely upgraded the team by trading for Tobias Harris at the trade deadline. Unfortunately, the same problem remains as they barrel toward the playoffs: their bench is going to be one of if not the worst in the playoffs. In theory, guys like James Ennis and Jonathon Simmons should be helpful. But that's the thing, the theory is a lot better than what we're seeing in practice right now. Teams aren't giving Ennis a lot of opportunities to shoot standstill looks from deep — the one area where he should be legitimately helpful — and when he has tried to counter tight coverage by driving and/or kicking, it has been sort of a disaster for Philly. They're going to need at least one guy from the wing group to rise from the muck between now and mid-April. • Portland absolutely killed the Sixers on the offensive glass early in the game. Between Nurkic and Kanter, the Blazers do have a pair of centers who can create problems there, but the Blazers were just abusing Philly there throughout the afternoon, which really takes the wind out of a defense's sails after they fight to get a stop. This is another area where Boban Marjanovic's lack of mobility/fluidity shows up. Yes, his size allows him to contest shots and deter drivers, but he is not particularly great at then facing the basket to collect the ensuing rebound. With Portland sending waves of perimeter players at the basket on misses, they quickly overwhelmed Boban at the rim. This is about Boban's limitations, sure, but once the Sixers saw what was happening, it should have inspired more commitment from the rest of their guys to make sure they brought down the rebound. Rebounding is often simply about desire, and Philly didn't have enough of it. There are reasons beyond the intangible stuff that they struggled on Saturday, certainly. Portland has great guards in the pick-and-roll and they're a great offensive rebounding team as it is, so they played to their script for the most part. But when you know that going in and allow Portland to take the mental/effort edge too? That's ridiculous. By the way, this was against a team from the West Coast, and while they've been on the road for a bit, this game started at 10 a.m. Portland time on Saturday. For the Sixers to be so thoroughly outplayed in that context on their home floor, Embiid or not, is inexcusable. • A lot of the focus on this game will be on Philadelphia getting killed in the paint, and that's probably a fair read of the game. But their perimeter defense wasn't a hell of a lot better, between poor effort, botched communications, and Portland smartly exploiting their weak links in the chain. Tobias Harris did not come here with a reputation as a stopper, but he has still been underwhelming on the defensive end since coming over. He deserves some time to get up to speed on reads, call-outs and so forth, but there have been too many times where he has been caught flat-footed by back cuts, giving opponents open looks at the rim. Things weren't much better for the incumbents. JJ Redick is a mediocre defender on his absolute best day, and on top of being a turnstile, he couldn't get anything to drop all afternoon. Simmons had one of his better games as an attacker, but he just gave up on far too many possessions, and the Blazers were happy to take advantage of it. When Joel Embiid is back there to clean things up, you don't notice the defensive errors and limitations as much. But the Sixers make too many simple mistakes as a unit regardless and need to clean it up before the playoffs hit. • Redick really deserves a bullet point of his own for how bad he was. He stunk up the joint on both ends. • I'm a fan of experimenting with small ball, but you have to pick and choose your spots to use it. Against Portland is not one of those spots, with Kanter and Nurkic quite capable of taking advantage of any mismatches in the post. Brown decided he was going to play Simmons or Mike Scott at center for a lot of the second half, which was kind of crazy to me. Total overreaction to Boban's early struggles in the second half. If anything, lean on Bolden more after what he did in the first half, don't bury him in the rotation completely. Especially after he had already shown he could hold up in this game! • Things got so bad for Boban in the beginning of the second half that Brett Brown turned to a wild card off the bench: Amir Johnson, who volunteered to go down to the G-League on Friday night to keep himself ready to play in the event the team needed him at some point, whether in the regular season or playoffs. To be clear, I thought that move said a lot about Johnson's character and is a perfect example of why the team wanted to keep him around this year, even as his skills have declined. But when the Sixers are in a position where they have to turn to him to play real minutes, they are almost certainly in trouble. And, of course, he got absolutely smoked by Nurkic when he was put on the floor. So it was bad times all around. I don't understand why Brown turned to him instead of Bolden, who played well in the first half and deserved that opportunity on merit, not just because he's a young guy who needs minutes. Considering how badly the Blazers outplayed Philly in the second half — and with Nurkic helping lead the way — I'm not sure that was the best timing for that trash talk.